For years Laia has lived in fear. Fear of the Empire, fear of the Martials, fear of truly living at all. Born as a Scholar, she’s never had much of a choice. For Elias it’s the opposite. He has seen too much on his path to becoming a Mask, one of the Empire’s elite soldiers. With the Masks’ help the Empire has conquered a continent and enslaved thousands, all in the name of power. When Laia’s brother is taken she must force herself to help the Resistance, the only people who have a chance of saving him. She must spy on the Commandant, ruthless overseer of Blackcliff Academy. Blackcliff is the training ground for Masks and the very place that Elias is planning to escape. If he succeeds, he will be named deserter. If found, the punishment will be death. But once Laia and Elias meet, they will find that their destinies are intertwined and that their choices will change the fate of the Empire itself. This book was pretty much everywhere in 2015. It has some amazing reviews and is up the top of the most popular books in 2015 on GoodReads, so I decided to see what all the fuss was about. 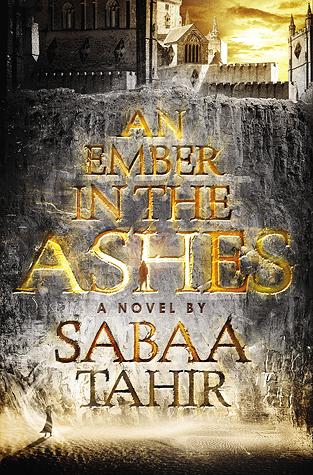 An Ember in the Ashes could quite possibly be the most blood-thirty novel I’ve ever read. There was so much violence and torture going on. The author certainly takes her characters to hell and back – I loved how real the world felt. Perhaps what made the novel feel the most realistic was the characters. So often in YA novels, the female protagonist is already skilled and brave. Think Caelena in Throne of Glass or Katniss in The Hunger Games. Or maybe they gain skills like Tris in Divergent… But I like how Laia fit in neither of these categories. In the beginning you could almost call her a coward (and she certainly calls herself that). But I loved how she didn’t leap to anyone’s defence, I love how she chose to save herself because she knew she didn’t have the skills to do otherwise. I found it oddly refreshing. All in all, this sucked me in. It was an amazing, engrossing read. It was fast paced, thrilling, the characters were interesting, and just… wow. This entry was posted in Book Reviews and tagged 2015, 5 stars, book blogger, book review, dystopian, fantasy, romance, violence, YA, young adult. Bookmark the permalink.